The kayak is a transportation and hunting tool that has been used in Greenland for centuries and even today the kayak is one of the strongest cultural symbols of the Greenlanders' adaptability to a changing and challenging environment. Explore Greenland like the Greenlanders did and still do. Paddle through fjords filled with huge icebergs surrounded by steep mountain peaks. Enjoy the silence – maybe interrupted by the sound of a whale spout. Observe these huge creatures playing or resting at the surface before exposing their tail flukes when diving into the sea. Visit small villages on your way and stay overnight at remote campsites. 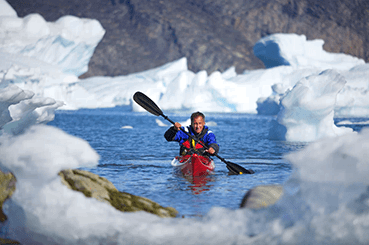 Exploring Greenland from a kayak is one of the best and most authentic ways of experiencing the island!